It is something I never thought I would see in my lifetime and I doubt anyone thought would ever happen when Donald Trump was elected president. 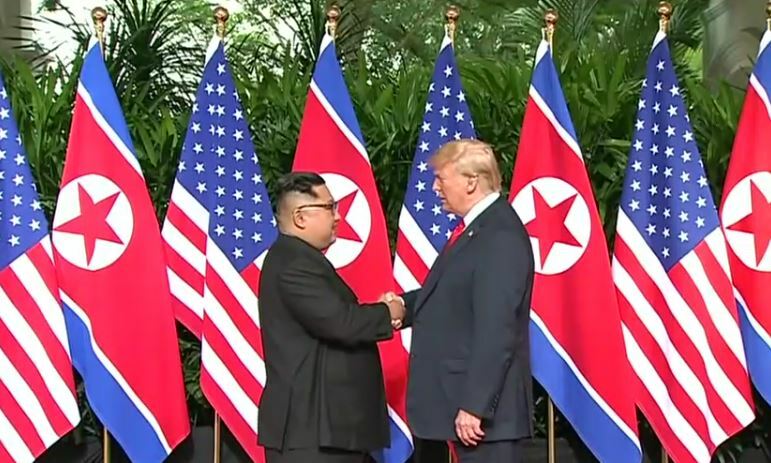 President Trump and North Korean leader Kim Jong-un met personally and shook hands at the at a historic summit in Singapore. Will this be the start of the change needed to denuclearize the Korean peninsula and make the world a safer place? There is much more to do, but everything must begin at a starting point. 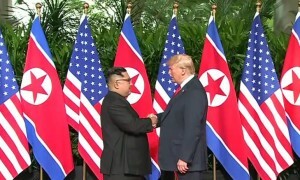 Donald Trump has met Kim Jong-un, shaking the North Korean leader’s hand and posing for the cameras at a historic summit in Singapore. Mr Trump arrived at the Capella hotel on Sentosa island looking slightly pensive, fiddling with his jacket buttons; Mr Kim appeared relaxed. The pair greeted each other at a luxury hotel on the island, just off the Singaporean coast, before heading in for talks about denuclearisation. It is the first time sitting leaders from both countries have ever met and marks a remarkable turnaround in the men’s personal relationship. As reported at the BBC, the leaders of North and South Korea have met in the demilitarized border area between the two countries. This meeting is only the second between South Korea’s Moon Jae-in and the North’s Kim Jong-un. Many in the MSM and on the LEFT ridiculed and mocked President Trump when he canceled the summit ahead of the planned June 12th date to be held in Singapore. Because the LEFT was more happy that Trump not gain a victory than the United States and the world. 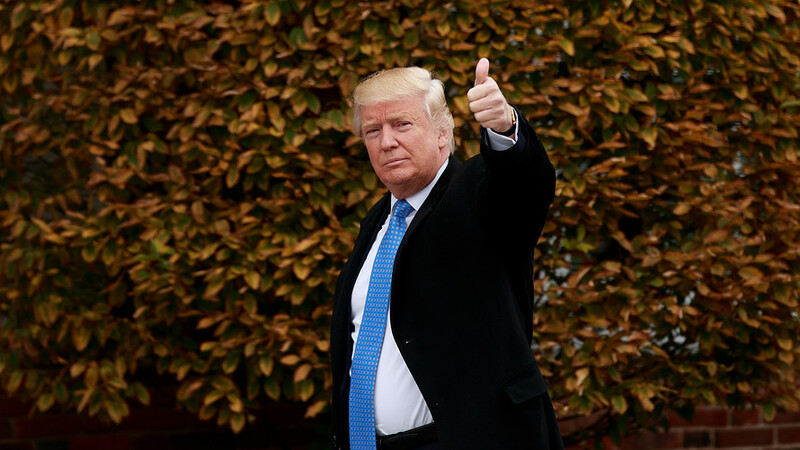 However, President Trump stated that he was still optimistic and maybe it would still go on. This surprise meeting between South Korea’s Moon Jae-in and the North’s Kim Jong-un is certainly a positive sign. The meeting is only the second between South Korea’s Moon Jae-in and the North’s Kim Jong-un. It comes as the two sides continue efforts to put a historic US-North Korea summit back on track. US President Donald Trump cancelled the summit, scheduled to be held in Singapore on 12 June, but later suggested it might still go ahead. The latest talks were held on the northern side of the Panmunjom truce village, between 15:00 and 17:00 local time (06:00 and 08:00 GMT), Mr Moon’s office said. “Both leaders exchanged opinions… for the successful holding of the North Korea-US summit,” it added, saying that Mr Moon would announce the outcome of the talks on Sunday morning. As reported at The Washington Times, North Korean dictator Kim Jong-un has surrendering to another of Present Trump’s demands ahead of their planned historic meeting. Three United States detainees were released from prison camps in North Korea. It wasn’t too long ago the LEFT was claiming that Trump was headed to nuclear war with North Korea. Instead he is negotiating the release of 3 Americans from North Korean labor camps. 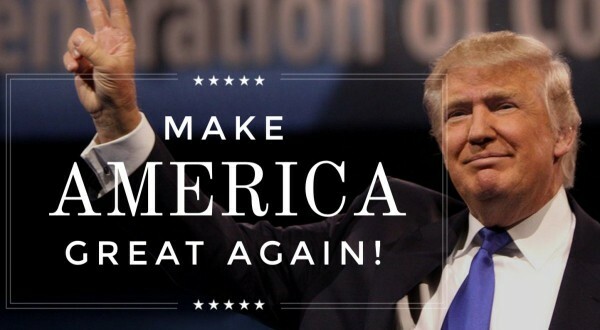 Trump is doing amazing things, it is just too bad that the liberal media, Democrats and the LEFT can not give credit where it is due. These are the types of actions that one is supposed to be nominated for and win a Nobel Peace prize. AND THE MSM IGNORES THIS HUGE TRUMP WIN … PEACE THRU STRENGTH WORKS … NORTH KOREAN DICTATOR KIM JONG UN BLINKS! FIRE & FURY, LOCKED & LOADED WON!!! 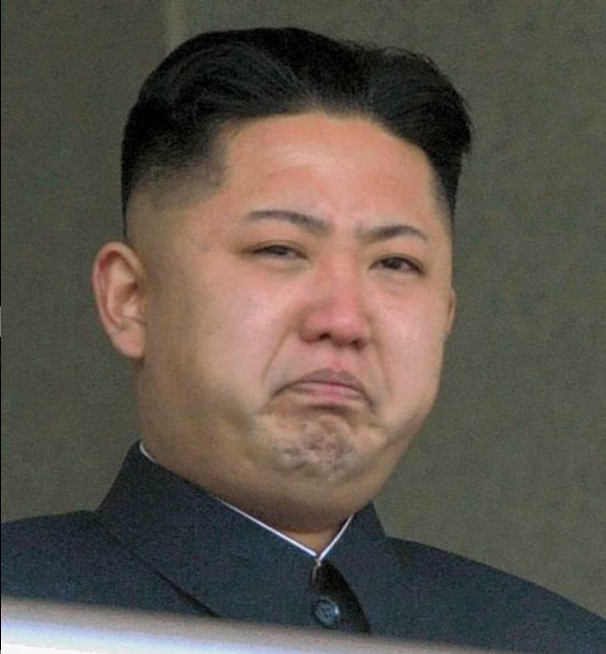 As reported at the WSJ, North Korean Leader Kim Jong Un has decided not to launch a threatened against Guam as previously stated. In a face saving moment, the the North Korean dictator warned that he could change his mind “if the Yankees persist in their extremely dangerous reckless actions.” Who has been reckless? 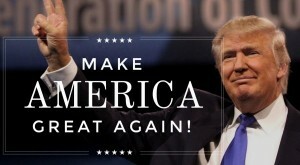 But the story that is going unreported is that President Donald Trump just had a huge foreign policy victory and the MSM acts like it never happened. 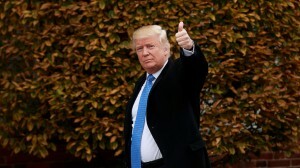 Not only did the United States under President Trump win a 15-0 victory in the United Nations gaining further sanctions against North Korea, but Trump also go China to state that if North Korea attacks the U.S., China should remain neutral. In other words, North Korea would be on their own. HUGE! President Trump was ridiculed by the LEFT, Democrats and the MSM for his actions he took against North Korea. Trump was called reckless by the media, not the North Korean dictator. Look who was correct and look who was wrong. TRUMP WAS RIGHT! CNBC - China hands Trump a win on North Korea crisis. In the end, China decided to back off their support at any cost of North Korea and agreed to state that they would remain neutral if North Korea Dictator Kim Jong Un was so foolish and reckless as to attack the United States with nuclear war. So why did China back away from what was their position on North Korea for decades? Was it maybe because Chinese President Xi Jinping was at a dinner with President Trump at the Mar-a-Lago estate in Florida, when he got to see up close and personal how committed Trump was as President when he ordered 59 U.S. cruise missiles to rain down on a Syrian military airfield in response to what Trump had called “a disgrace to humanity.” The liberal media made a joke of it, but it sent a message to the adults in the room. Note to the LEFT, Peace through strength works. After a weekend filled with a series of conciliatory statements from China, some of them downright surprising, the situation with North Korea seems to be less tense right now, which could be construed as a major win for the Trump team. To be specific, the big move came Monday as China agreed to ban imports of North Korean iron, lead, and coal as part of new U.N. sanctions on Pyongyang. That’s hitting Kim Jon Un’s regime where it hurts. But there was also the statement in the Chinese-run state newspaper Global Times on Friday that said that if North Korea attacks the U.S., China should remain neutral. In other words, they’d be on their own. And there was even calming talk from this side of the Pacific. In a jointly-written editorial in Monday’s Wall Street Journal, Secretary of State Rex Tillerson and Secretary of Defense James Mattis both insisted the Trump administration is not seeking regime change in North Korea and wants a diplomatic resolution to this dispute. While these developments do not fully constitute a real solution to the potential threats North Korea’s nuclear and missile programs pose to the region and the world, everyone’s nervous meter seems to have gone down several notches. WHO HONESTLY THINKS THIS COULD HAVE HAPPENED UNDER A PRESIDENT CLINTON, AND IT NEVER DID UNDER OBAMA.